Buying a microwave can be overwhelming, especially when there is a huge range to choose from between features and functions. Many people choose a microwave based on its cooking functions when it comes to what type of food you can cook with it, and look for cooking “presets” such as defrosting, and cooking chicken, but that is only the tip of the iceberg. When it comes to buying, there are a lot of features that should be considered beyond the basic functions that we break down for you below. A microwave works on the principle of an electronic cooking device, therefore, looking for how much power the microwave cooks with can be loosely linked to the heat of a conventional oven. If your oven only cooked at 150c, then it wouldn’t be adequate for cooking a variety of different foods. Microwave power is measured in watts, much similar to other electrical items such as vacuum cleaners. With more power, you will have more possibilities, as well as being able to cook the food faster in some instances. A dessert that may need to be cooked for 30 seconds by a microwave that has a power level of 1000w may only need 20 seconds in a more powerful model. As you will see on the back of any microwavable food, there are different categories of cooking times, based on this power ratio. Most modern microwaves come in power level categories ranging from A through to E. A microwave that is placed in category “A” will be of less power, such as a budget 800w model that will take longer to cook the same food as a microwave that is of category C such as a 1000w model. Most home microwaves range from category A to E, while some home models and commercial models take the higher power ratings all the way up to 2200w and sometimes more. These category ratings only relate to the microwave function of the oven, and not to the grill or convection functions. One thing to note is the difference between the heating or cooking power of the microwave, and the power rating of the microwave, which is there to indicate how economical a particular model will be when cooking. So, now that you understand the different types of microwave out there, as well as their power ratings to fit in with your cooking style, it is time to choose the microwave that best suits your kitchen. Let’s break it down into further categories to help prioritize your decision based on some important factors that you should consider. The size of your kitchen may determine which microwave you choose, as well as the way in which you install your microwave. If you have a small kitchen, then a built-in microwave will be the obvious option for you, as saving the maximum amount of space is obtained when you place your microwave in a cabinet. A smaller microwave may mean that you will be limited by the cubic capacity of the oven itself, so cooking for large families or large meals such as chicken, turkey or beef may be difficult. Larger, combination microwaves will need a little space around it for heat ventilation, so securing the perfect place in your kitchen for a large microwave oven is key to its installation. If you are looking for the most versatile microwave out there that also looks great, then be prepared to pay top dollar for it. Built-in microwaves offer a slick, stylish alternative to tabletop ovens, and also come in a wider range of finishes to match your kitchen surfaces and cabinets. Opting for a microwave that has the most amount of functions also offers you the most versatile options with the ability to microwave, grill, bake and even roast with some of the better convection, grill and combination microwave ovens on the market. Choosing a microwave that won’t break the bank is a great place to start from for your next big purchase. Smaller, budget microwaves offer a great addition to any kitchen, and also offer a decent range of basic functions such as defrosting, cooking, heating and boiling. Choosing a mid-range microwave with added grill functions could be the perfect price point for most requirements -offering a wide range of cooking options, with the added ability of the grill function to cover the basics for any style of cooking. 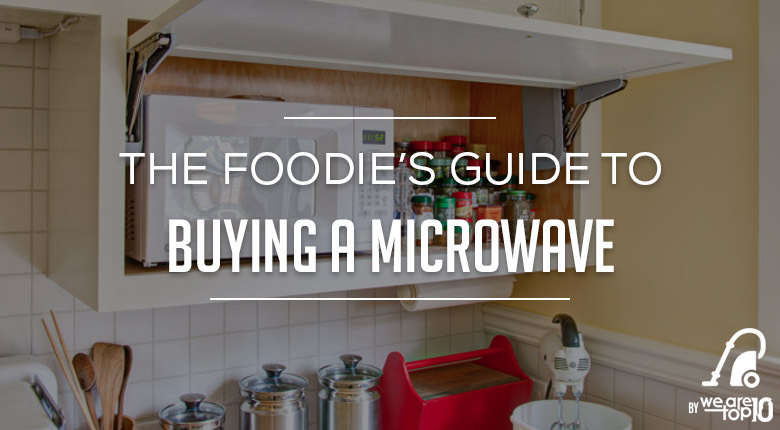 WITH A CORNUCOPIA OF CHOICES OUT THERE, WHICH MICROWAVE WILL SUIT YOU AND YOUR KITCHEN BEST? Along with similar kitchen “white goods” microwaves have a decent lifespan running anywhere from 5 to 10 years if well maintained, so the types of microwave available on the market today may have changed dramatically since you were last on the look-out for a new-fangled kitchen cooker. With the addition of combination ovens, grill features and even some microwaves that feature pizza ovens and bread baking facilities, your best choice in choosing the perfect microwave for your kitchen may come down to one of four things: Budget, form and style, function and your very own cooking habits. Along with these few features are the different ways in which the microwave has been incorporated into the modern kitchen, such as built-in microwaves, table-top or combination ovens with microwave functions. There are some different varieties of microwave on the market that can offer you a range of features and functions you may have otherwise thought impossible. To break down the range of microwaves on offer, we have categorized them into their basic forms and price brackets. The standard and basic model table top microwaves offer a great value price point to make an additional and alternative cooking method to your kitchen. These basic models often contain fewer features than their bigger brothers such as advanced cooking modes and presets for cooking various types of food, as well as offering limited feedback from a digital display. The basic model table top microwaves often do not feature combination grilling or oven features and often feature just the simple microwave cooking function. This can be a great addition to any kitchen for simple means such as defrosting meat, heating milk and ready meals as well as cooking smaller-sized dishes such as jacket potatoes. These types of microwaves offer an additional cooking method, in combination with the microwave cooking function. The added benefit of having a small grill function to your microwave is perfect for cooking additional meals, allowing you to brown and crisp your food making it perfect for pasta bakes, pizzas, and lasagnas, which would otherwise not be possible to cook in a standard non-grill microwave. A microwave grill also may include additional parts to help cook food, such as a metal grill or rack. This is used to raise the plate or food near the grill which is located on top of the inside of the cooking space. This means that you can toast bread, melt cheese, brown your bakes and even bake desserts and treats at the touch of a button. Microwave grills often offer a combination cooking method, so that food can be defrosted, cooked and then baked and toasted for an all-around cooking machine that can replace your oven and your grill at the same time for added value. Combination microwaves are the most versatile and offer a combination of cooking methods used in modern kitchens. Included in their cooking modes include traditional microwave cooking, grilling function, as well as a convection oven function that can half your cooking time. The convection oven function uses a hot air fan and a grill to allow the heat to circulate inside the oven to cook the food more thoroughly and quickly. Cooking faster means cooking more economically, saving you time and money on your electricity bill. Not only does the added function of having a convection cooking oven help with defrosting and cooking your food faster, but also includes the ability to replace your oven, grill and microwave altogether. Cooking foods such as roasted lamb, chicken, and pork is a synch, and saving you plenty of time on defrosting, too! Built-in microwaves are a great choice for those looking to save a little bit of space in their kitchen, such as on countertops and work surfaces while giving them the added benefit of having an additional cooking method in their kitchen. Built-in microwaves are just like regular microwaves, which come with a variety of functions and features such as basic functions, grill, and convection combination oven systems, but are installed into the kitchen cabinets themselves, offering a sleek and modern look. The range of built-in microwaves available is wide and fully-featured, featuring some of the biggest names in the business, from budget models to designer kitchen-wear brands. Many people opt for a built-in microwave to free up space in their kitchen, as well as to give a clean, designer look to their cabinets and workspaces. What is better, a microwave with a turntable or a tray? The vast majority of microwaves use a moving turntable inside them to keep the food moving at all times. This means that the food is heated and cooked evenly – important for defrosting food. In some more modern microwaves, the turntable is replaced with a tray that moves in a side-to-side motion to allow the food not to stay still while cooking. A moving tray is required when cooking on large rectangle plates, or dishes that couldn’t otherwise turn-it depends on your plates and dishes! How do the shortcut keys and functions work? Most microwaves feature shortcut keys that allow users to quickly start cooking certain foods with one single button click. These shortcuts vary depending on which model microwave you have and are used as a function to cook certain popular foods for standard times. These often include popcorn, hot drinks, meat (based on weight) and defrost functions. They are there to simplify cooking, without having to manually dial in a specific cooking method and time. Which is best, a digital or analog timer or screen? On older microwave models and some newer budget models, the timer function is determined by an analog dial. The dial is set to the preferred cooking time and slowly counts down until the time is up. It may be harder to see how long the cooking time has left on these dials, which is why many modern microwaves offer a digital display and timer button function. A digital display allows you to easily see the cooking time and countdown timer of the microwave, and the cooking time is set by pressing on a number pad on the front of the microwave. Many people see a digital display as added extra, as budget models rarely feature them. Which power rating is best? Microwaves come in a variety of power ratings to determine how hot the microwave cooks at and how fast the cooking time may be. A lower power rating of 800w will take longer to cook the food, while a higher power rated microwave of 1800w will cook food faster and be more energy efficient. Which microwave oven is best for making pizza? The Grill Microwave should be your choice if you want to make pizza at home. Which microwave oven is best to grill or convection? The difference between grill and convection microwave is that in the grill model you can only heat, defrost, cook or grill food, but in the convection, you can do all these things and bake as well so when it comparing both, convection microwave offers more bang for your buck. Which microwave oven is best for baking? Convection microwave or Combination microwave are both best for baking; it can be anything from cakes to soufflé or pies.